Is it possible to cheat at slots and get away with it? Certainly, many people have tried and some of them have actually been successful, at least for a time. One of the most well known people to be able to successfully cheat at slots for a period of time is Tommy Glenn Carmichael. Carmichael once owned a television repair shop but quickly decided that there was more opportunity available in playing slots. The first method that Carmichael used to cheat at slots was a device known as a top-bottom joint. It was devised during the 1960s. Carmichael managed to first score $35 from a slot machine in Las Vegas using the device. Eventually he was caught with the device in 1985 and sentenced to five years in prison. During his stint in prison, he and another inmate decided to join forces upon their release. After discovering that the technology behind slot machines had changed they found it necessary to purchase one of the more modern machines in order to determine how the machine worked. This led to the development of a tool known as a slider. The slider was made using guitar wire and could be inserted into the slot machine in order to trip a specific switch, which would release coins. Eventually slot machines made a move toward being computer based and it was necessary for Carmichael to invent yet another tool. In order to invent this tool Carmichael posed as a customer and managed to get inside a manufacturing facility that produced slot machines. This was the beginning of the light wand, a tool that featured a camera battery along with a small, but bright line. The tool would be used to shine on the inside of the slot machine and actually blind the machine's sensor. This would cause the hopper to release coins. The benefit of the light wand was that it was almost undetectable. It worked so well that Carmichael actually began to sell the light wand to others. This proved to be a very lucrative business for Carmichael and for a time he was able to lead a luxurious lifestyle based on his sales of the light wand. It was as a direct result of Carmichael's ability to foil the machines that manufacturers continued to make the technology of slot machines increasingly difficult, eventually coming up with the Actuator Arm. 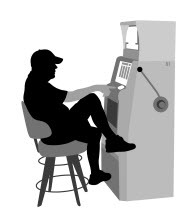 Carmichael and his associates responded by developing slot machine cheating devices that were capable of getting around even the latest safety devices. Eventually, Carmichael was caught using the light wand red-handed at a slot machine at Circus Circus. The charges for the incident were finally dropped but Carmichael hit another streak of bad luck when he was caught in a similar situation in Atlantic City. The authorities had become involved by this time and Carmichael's phone had been tapped. This time charges were pressed and Carmichael pled guilty. As a result he served three years probation and was banned from entering casinos. Even today, he's among the top names blacklisted from most if not all of the casinos across the United States.